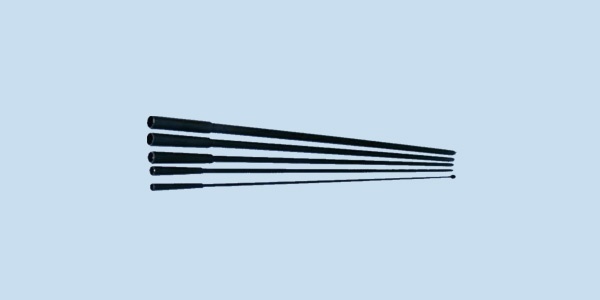 AD-4 is a configurable HF monopole antenna composed of several sections, with bases suitable for various installations and heights. Antenna radiator sections are 120 (4’) cm long that attach to a spring or rigid vehicle mount for vertical polarization and NVIS applications. The AD-4 antenna sections can be mounted on the antenna base type AP-4/M (up to 4 sections) or on the base type AD-4/MHD (up to 7 sections), made of composite materials and a biconical SS spring enabling the antenna to bend with the rope horizontally for NVIS applications. The antenna sections are packed in a canvas bag for transportation and storage. The antenna AD-4 could be used also stationary with the antenna base type AP-4/S or side feed base type AP-4/SF. A special antenna base type AP-4/MHL was designed for NVIS applications. The AP4/MHL has a special locking system enables the spring to lock for a rigid configuration or unlock for a horizontal configuration for NVIS applications.